Execute a search from any page on Mackin.com using the Easy Search tool, located in the header. Easy Search is particularly convenient if you have a specific ISBN. To set an Easy Search default, log into Mackin.com and navigate to My Mackin > My Profile. My Profile preferences apply to Easy Search results except for Search Page Preferences. 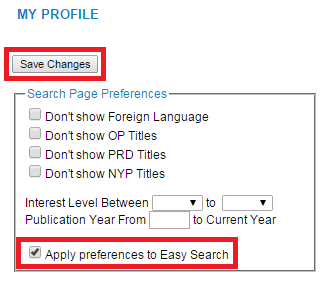 If you want your Search Page Preferences to apply to Easy Search results, check the box next to Apply preferences to Easy Search. Remember to click Save Changes when you’re finished. You will need to refine your search if your search results return more than 500 titles. If your search term is too general and returns more than 500 items, a pop-up message will appear giving you several options. You may either add more parameters to your search, filter the results by Compendium titles, or narrow your search results by setting limits in My Profile. If you choose to add more parameters, you will be taken back to the Advanced Search page to enter information in another field to narrow the search. While searching for titles on Mackin.com, you can perform a search for a specific ISBN or a list of ISBNs. 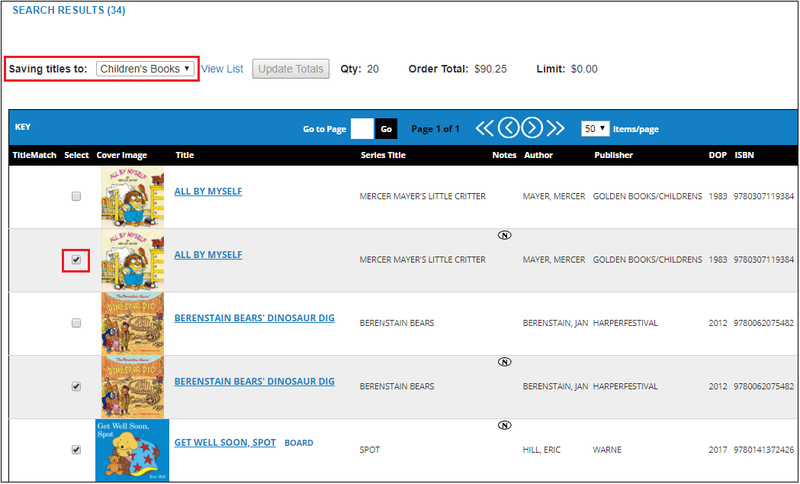 Log into Mackin.com and select ISBN from the dropdown menu next to the Easy Search box. Enter or copy/paste the 13-digit or 10-digit ISBN into the search box and click the magnifying glass or press Enter on your keyboard. The system automatically removes hyphens from the query. From the Search Results page, you can select the title to your list. Please Note: The search may return multiple results. Titles with MackinBound and paperback formats will have the same ISBN. Additionally, eBooks with different license/access types may have the same ISBN. Log into Mackin.com and select Advanced Search from the Advanced Search dropdown menu. Click on the dropdown menu next to “SEARCH BY” and select ISBN. Enter or copy/paste the 13-digit or 10-digit ISBN into the search box and click the Search button or press Enter on your keyboard. From the Search Results page, you can select the title to your list. 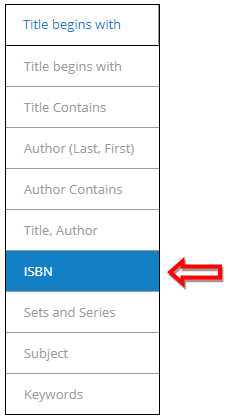 Click on the dropdown menu next to “SEARCH BY” and select List of ISBNs. Enter or copy/paste the list of ISBNs into the search box and click the Search button or press Enter on your keyboard. The list can be separated by commas, spaces, or line breaks. From the Search Results page, you can select the titles to your list. Please Note: Your Search Page Preferences (located under My Profile) may cause searches to come back with “No Results” when in fact the title is in the Mackin database (e.g. if your interest level is set at K-2, the Harry Potter series will not come up when you perform a search). If you can’t find a title, please adjust your Search Page Preferences and try again. The Mackin.com database is the largest of its kind. Finding the titles you need begins on the Advanced Search page. Log into Mackin.com, mouse over the Advanced Search dropdown menu and select Advanced Search. You may also access any of your last five searches, including Easy Searches. Enter keyword queries when using Title Contains, Author Contains, Sets and Series, Subject, and Keywords. There is no need to worry about commas, quotation marks, word order or case. 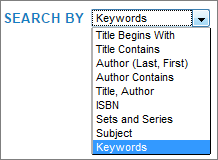 Use the Title Begins With, Author (Last, First), ISBN, and Title, Author fields for more precise searches. Return to a fresh Search page by clicking the Clear button. It is helpful to understand how the database interprets keyword queries. The system automatically inserts an implicit “AND” between the words in your keywords queries (Title Contains, Author Contains, Subject Series and Keywords). For example, entering the words looking glass in the Title field prompts the database to find all the title records containing both keywords. The search results will include Lewis Carroll’s classic Through the Looking Glass as well as the titles Looking Glass Wars, Looking at Glass Through the Ages and Looking Through Grandmother’s Glasses. Keywords: Searches for keywords, matching titles, alternative titles, series titles, authors, added entries and subjects in the database. Title Contains: Searches for keywords matching titles in the database. Also searches through the Alternative Title and Series Title fields. Title Begins With: Searches the database for precise matches to titles, subtitles, alternative titles and series titles in the database. Author Contains: Searches for keywords matching authors in the database. Also searches through the Added Entry field, which often contains the names of illustrators and other contributors. There is no need to use commas in the authors’ names or to put names in any certain order. Author (Last, First): Searches the database for precise matches to the author query, which requires the author’s last name followed by the first and separated by a comma and a space (e.g. shakespeare, william). Title, Author: Searches for matching keywords in all the titles, alternate titles, authors and added entries in the database. There is no need to separate query terms with commas or to enter them in a particular order. Subject: Searches for matching keywords in all the subject headings in the database – the actual Library of Congress or Sears subject headings in the MARC Records. Sets and Series: Searches for keywords matching the managed sets and series records in the database. ISBN: Searches for matching 13-digit and 10-digit ISBNs in the database. The system automatically removes hyphens from the query. 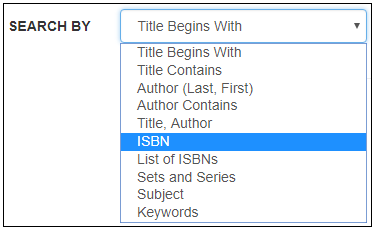 On the Advanced Search page, you can enter or paste a list of ISBNs into the search field and return a result. 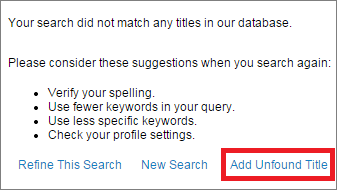 Combination searches: Use the Keywords field for combination searches, such as Title/Subject or Title/Author (e.g. sunset sailing or dragon smith). Be specific: “Dog training” will yield better results than simply “dogs.” Similarly, “Battle Bunker Hill” or “Crossing Delaware” are preferable to “Revolutionary War.” Ideally, your searches will generate 20 or 30 titles – that’s one or two pages of titles to peruse. Even 100 search results occupy more than six pages of titles. Use multiple search parameters: To achieve a more manageable search result, we recommend including at least two parameters in addition to your query. 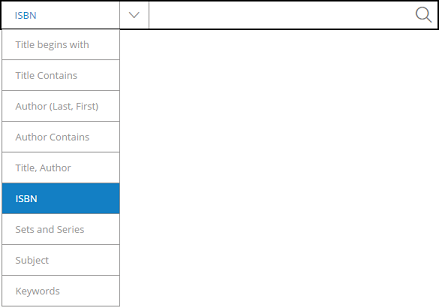 Select a binding/format preference: From library and trade to DVDs, maps and kits, you can choose from a variety of bindings and formats in this dropdown menu. 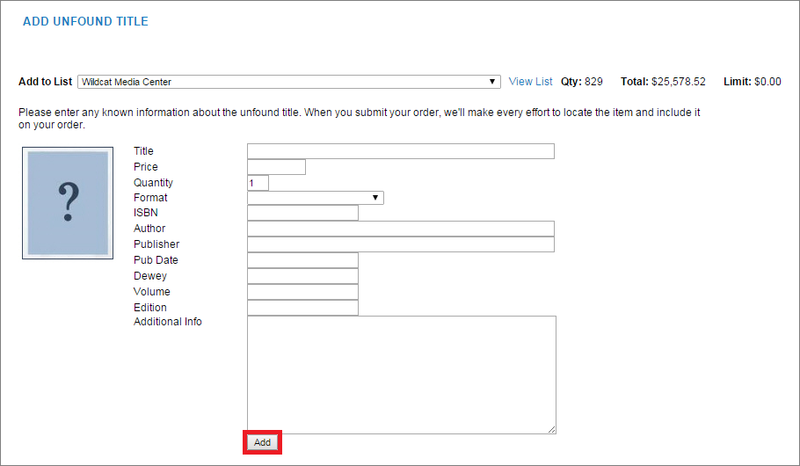 You can also narrow your search with the Best Bind option. 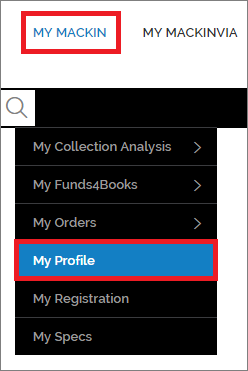 Take advantage of My Profile: You can set various search preferences on the My Profile page such as interest level, publication year and Preferred Format Order. These parameters will appear on the Search Page whenever you start a fresh search. 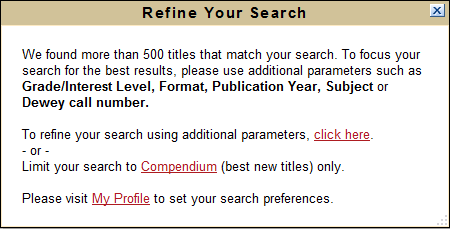 Choose the ‘Compendium Titles Only’ option: This option will limit your search to titles found in current and past issues of Compendium, Mackin’s semi-annual publication of highly-reviewed titles. Languages: Terms such as bilingual and dual language are effective keyword searches in addition to the specific languages listed in the dropdown menu. Graphic Novels: To search through a selection of available graphic novels, enter “graphic novel” in the Keywords field along with other relevant keywords (e.g. graphic novel naruto or graphic novel princess). Large Type: To search through a selection of available titles in large type, enter “large type” or “large print” in the Keywords field along with other relevant keywords (e.g. large type mystery or large print school). World Wide Rights (WWR): It is now possible to search with the WWR parameter for Online Databases and Digital Audiobooks. Mackin has a special search field just for Sets and Series to help you find what you’re looking for. Searching by Sets and Series yields slightly different results than other search parameters. For example, searching for “Junie B Jones” brings up the following search results page. Search results display the series title available in each format, with the number of items available in each format listed after the series title (keep in mind that all titles in a series might not be available in all formats). The columns displayed are limited on this screen and cannot be altered. 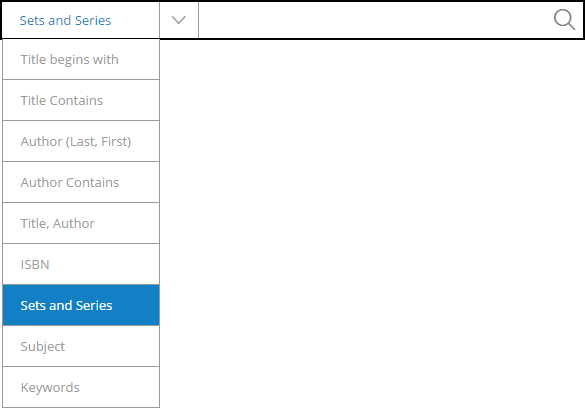 If specific series titles have not previously been selected, you can do so from the search results screen by clicking to the left of the series title in the desired format. Once selected, all of the titles from the series will be added to your list. A brief description of the series and specific titles within the series can be viewed by clicking on the series title. The columns in this view can be altered. 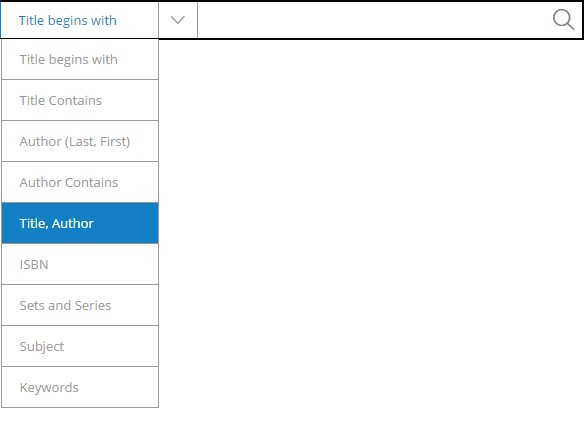 If you prefer, individual titles can be selected by clicking on the series title in the desired format, and selecting the specific titles that you want added to your list. As always, clicking on the individual title within the series will bring up Full Record information. TitleMatch is only engaged on the individual titles screen. 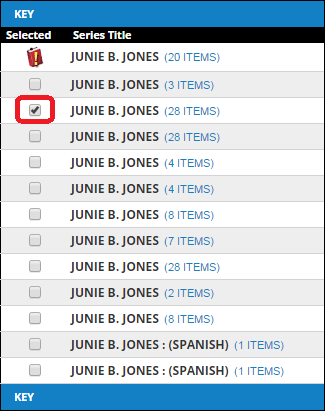 Because lists default to displaying in alphabetical order by title, individual titles within a series may not be listed together when viewing the list. In order to see them together, you will need to make sure that you have the series column selected (see Display More Item Information for instructions). If you click on the underlined Series Title header, the column will sort by series. For some items, you may notice symbols next to the series title that look like the following screenshot. A checkmark ( ) indicates that all of the titles in the series have been selected. The + ( ) icon means that the full set/series has been selected plus additional copies. The ! ( ) icon means that the partial sets/series has been selected. Occasionally, you may be unable to find a title you are looking for on the website. This does not mean that we cannot provide the title. If your search has returned no results, you may add an unfound title to your list by clicking the Add Unfound Title link and entering as much information you have about the title. The more descriptive you are the easier it will be to find your title, so please enter all known fields. Our selectors at Mackin will search for the title to add to your order. You may also request a title search from a customer service representative if you need a more immediate response or have multiple titles you are unable to find. Call 800-245-9540 or email customerservice@mackin.com.